"Uhm..I'm 17 years old, but my brothers say I act like I'm 10. Hehe!" 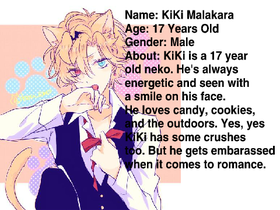 "I'm also a neko! Wanna see?" He bends down and his ears twitch.